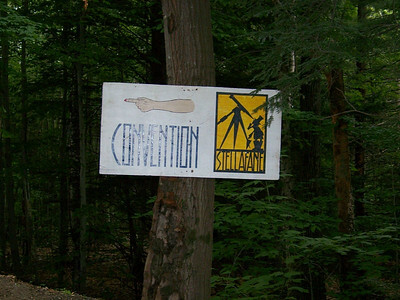 We make the 600 miles trip to Vermont - Images taken at this years telescope convention during Aug 1, and 2nd 2008. 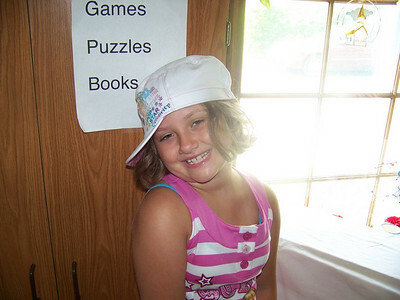 Daughter Stormie - poses for a shot at the Hotel - near Stellafane. 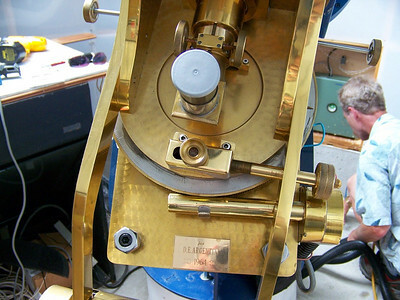 Flanders Pavilion holds telescope talk seminars as well as mirror grinding, polishing and testing. 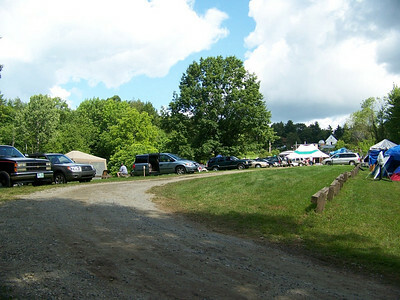 Cars and people begi to camp at the 2008 Stellafane convention. 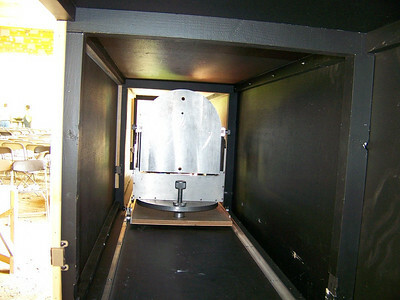 This is a self enclosed tunnel optical testing aparatus. One end supports the optic to be tested the other end cotains the testing device. 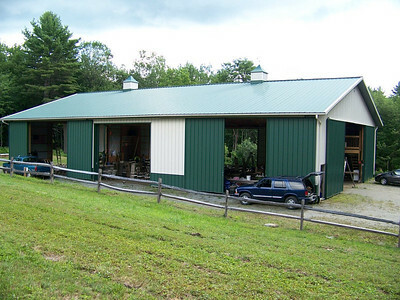 It is enclosed to suppress air currents within the system. 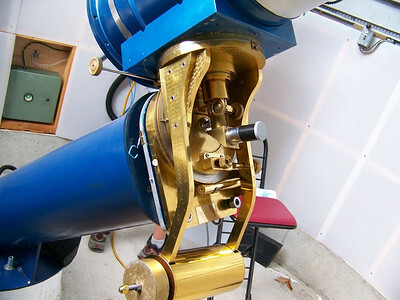 This simple setup allows one to grind and polish a precision telescope mirror. 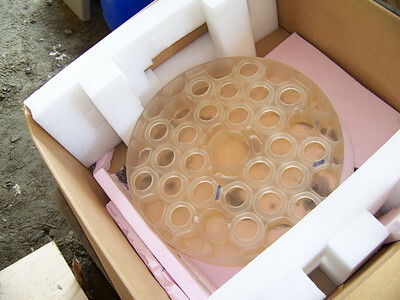 The "mirror blank" rests atop another "blank" similar in diameter . 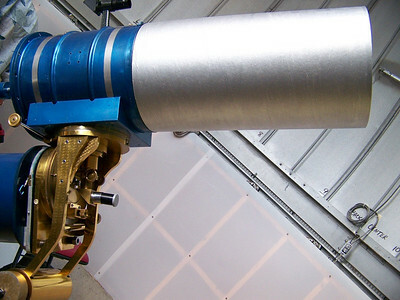 A process of rubbing the "blanks" together with grit between them creates the curve and ultimately a precision telescope optic. 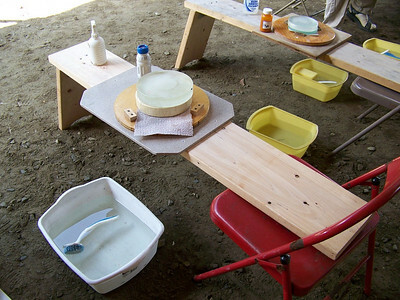 The board is stabilized by anyone who sits down comfortably in the chair to begin the grinding process. 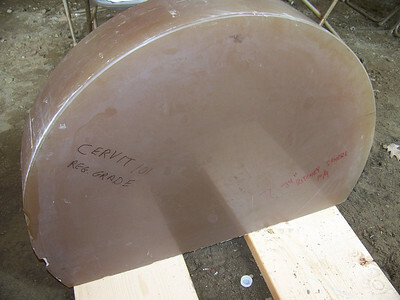 Here is a very large piece of ceramic glass know as Cervit. This glass has a very low expansion and contraction rate and is an excellent choice for a telescope mirror. Since this disk has an odd shape one would need to cut out smaller diameter round disks to be made into useful telescope mirror blanks. Here is a ribbed telescope mirror blank. 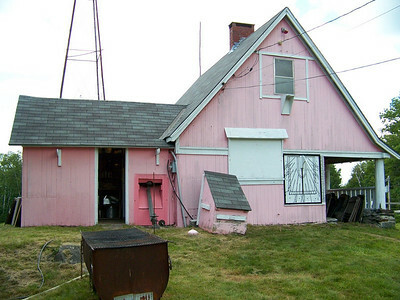 Sometimes referred to as a "Honey Comb" style blank. The structure of honey combed rib work makes a very strong blank weighing less than a solid mirror blank of the same diameter and thickness. 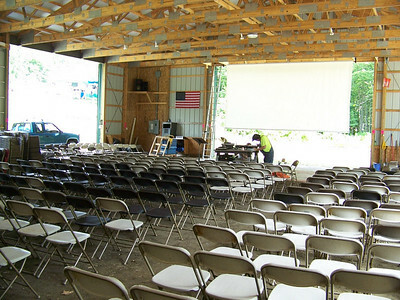 A projection screen along with plenty of seating occupies about one half of the Flanders Pavilion. 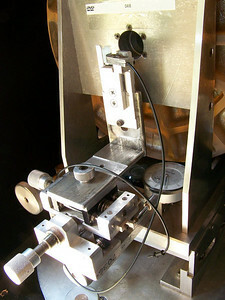 A well made Foucault Tester that resides within the optical testing "tunnel". Foucault Tester close up. Notice it uses a dial indicator and has what appears to be a "precision slide". 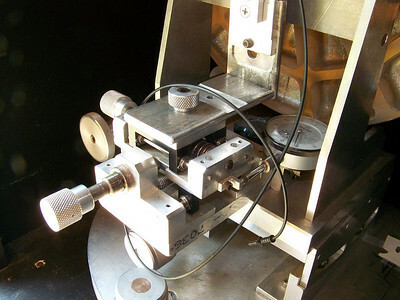 This device measures the longitudal shift in the traversing light & shadows that are visible on the tested optic. Another close-up of a portion of the "ingredients" to test optics. 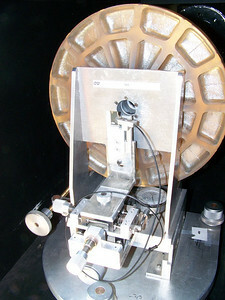 This Foucault Tester resides in front of a precision 12.5 inch optical flat. 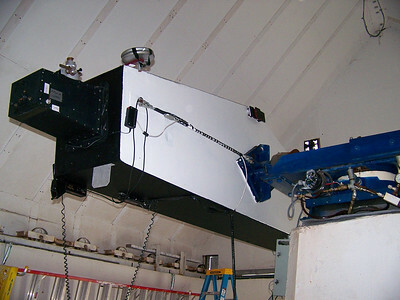 The tester throws out light to the telescope mirror being tested at the other end of the optical tunnel. 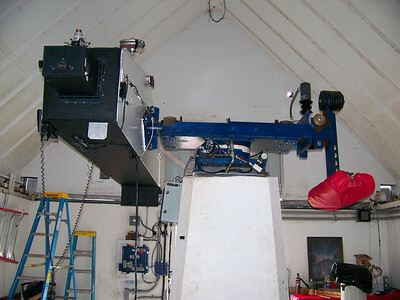 The light comes back from the mirror being tested to hit the big 12.5 inch optical flat mirror. 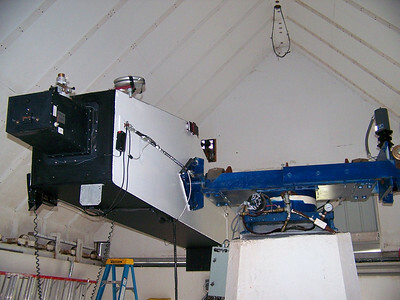 The flat mirror then reflects the cone of light back to the primary mirror being tested and the return beam comes back to us by passing thru a hole in the back of the big optical flat. 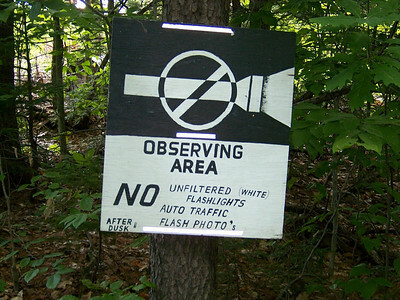 Since the light cone makes a double pass it is often called a "DOUBLE PASS TEST". 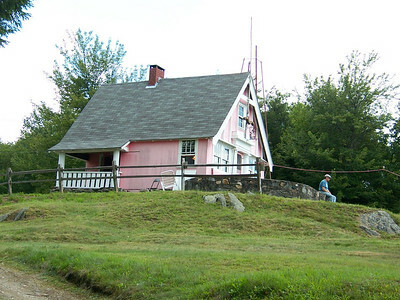 Using a set up in this manor is rewarding because it is twice as accurate as the standard Foucault test methods, due to the double pass, and the light effectively "nulls" out the light cone. Meaning the zones really don't have to measured when using this apparatus. What we are really looking for virtually NO longitudal movement, as measured at the Foucault testing device. 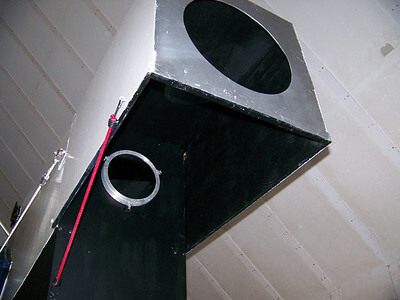 When this is experienced we have finished our telescope mirror! Several more mirror griding stands. 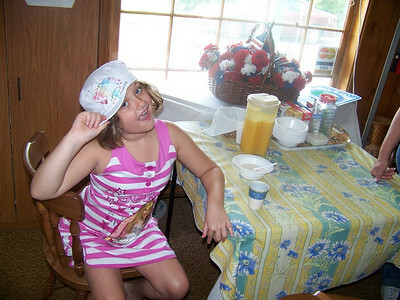 Sit on down , take your shoes off, set a spell, ya all come back now ya here! Here's a shot looking down the testing tunnel to where the telescope mirror you want to test would be. 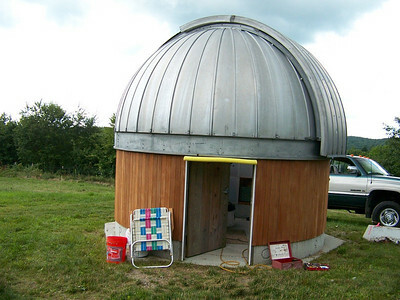 If you were polishing a telescope mirror you would place it within this chamber, face up towards us on edge, with the mirrors back vertical against the mirror stand shown. The stand has a knob to adjust the height of the mirror and it can also be adjusted from side to side so light coming down the tunnel from the Foucault tester will shine on it. 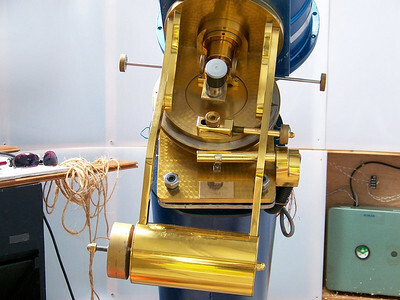 A close up of the more traditional setup for making telescope mirrors. 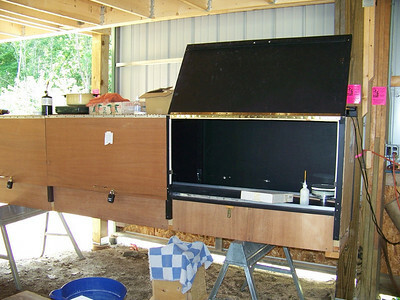 Here a plywood top is afixed to a 55 gallon steel drum filled 3/4 of the way with water. 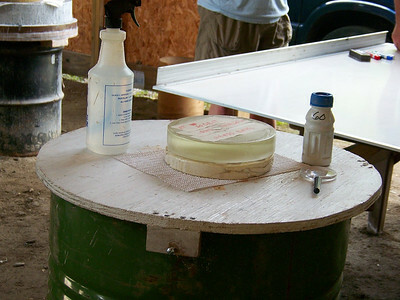 The Pyrex mirror can now be ground on top of a disk made of plaster and cermaic tiles called "the tool". 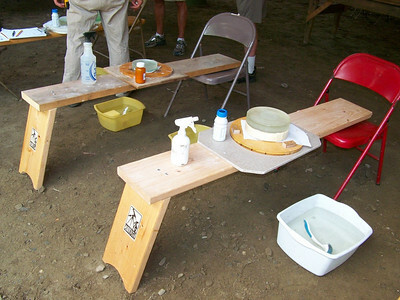 # 60 grit and a bottle of water shown is the grinding medium. 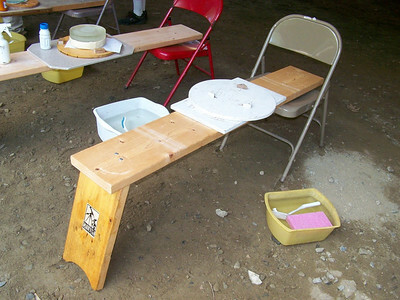 The mirror and tool sit upon a cloth that is dampened, and will stay put while the he two disks are rubbed together by hand. 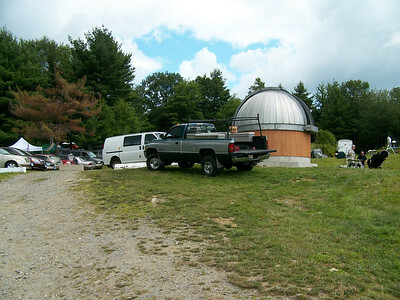 New to Stellafane this year is this observatory that houses a 10 inch RC telescope. 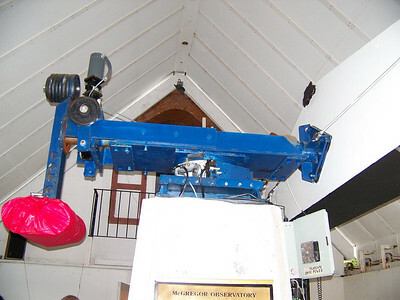 This instrument features the "Porter" or "Springfield" Mount. 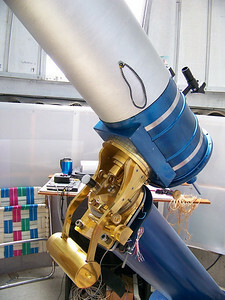 This is essentially a telescope that moves about the eyepiece which is stationary. 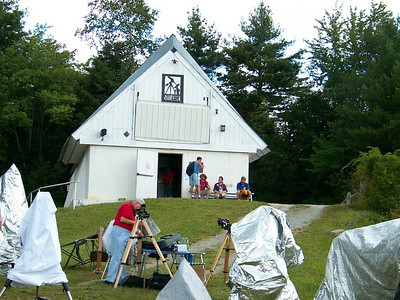 The advantages are clear for people who have limited access to the telescope. 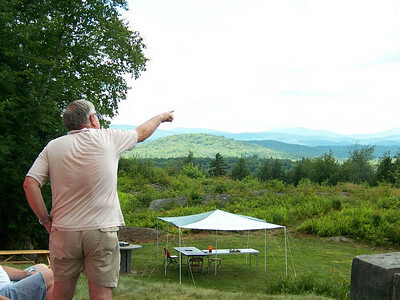 You can remain in a wheel chair and observe from what is basically part of a declination shaft!! 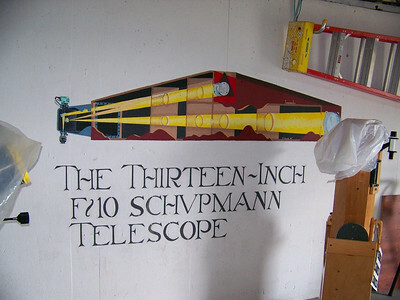 The telescope is a 10 inch Ritchey Chretien F-30 instrument. It features beautiful brass work. 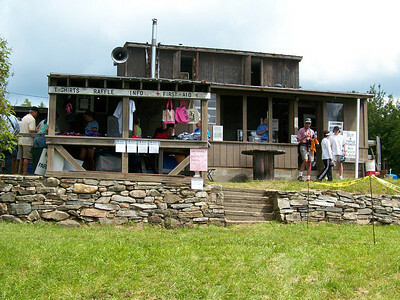 ... Gee well what do you know --- a place to spend money!! Side view shows beautiful diamond pattern in the brass work on this great instrument. 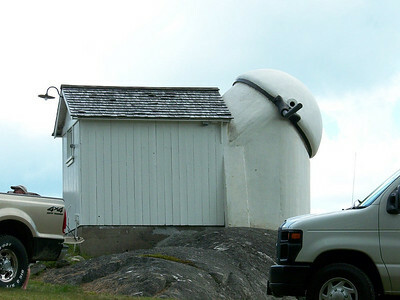 Another close-up of the unusual Springfield telescope. 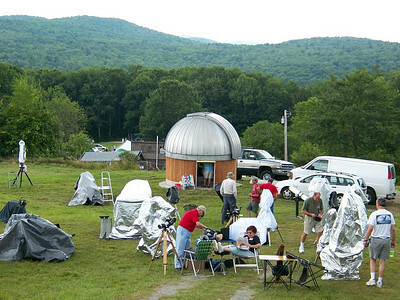 Poeple settin' up by the Schupmann telescope building. 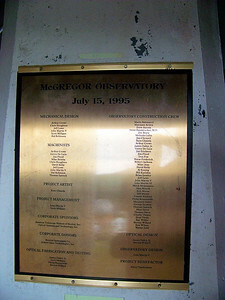 The McGregor Telescope roll call. 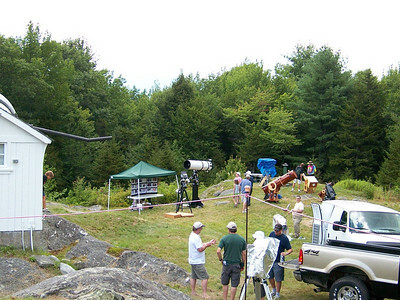 Quite a large instrument with a 13 inch primary. 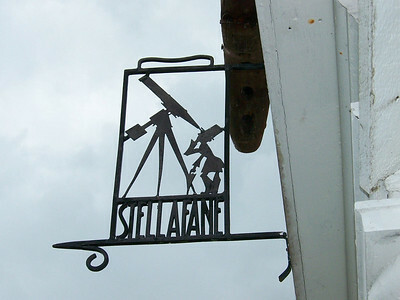 unusal Equatorial mount design -- if I may say so. 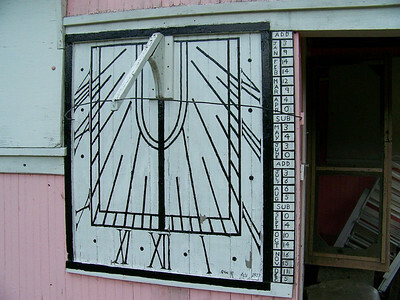 I believe this to be a Russel Porter sundial. 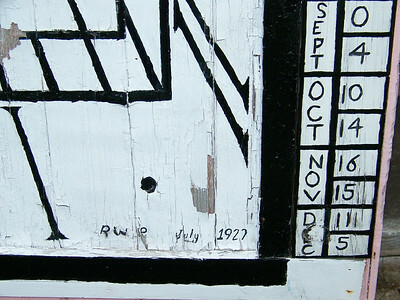 Signed by RWP (Russell W Porter) July 1927.